Vancouver Fairmont Hotel (regular harpist for Xmas High Tea since 2007), Westin Bayshore Inn, Waterfront hotel, Pan Pacific Hotel, Renaissance hotel, Sheraton Hotel, Chateau Whistler, Wedgewood Hotel, Sutton Place Hotel, Hyatt, Listel Hotel, Terminal City Club, Vancouver Club, Delta Hotel, Hilton Hotel, Coast Plaza Hotel, Four Seasons Hotel, Best Western Hotel, Pacific Landmark Atrium, Executive Hotel Richmond, Holiday Inn, Ramada Inn, Grand Villa Casino, River Rock. Vancouver Museum, Brock House, Cecile Green UBC, Hart House, Stanley Park Teahouse, Rowena's Inn, Vancouver Yacht Club, Stanley Park Rose Garden, Vancouver Rowing Club, Vancouver Aquarium, SFU Diamond Club, Burnaby Mountain, Minnekhada Lodge, Hycroft Manor, Crofton Manor, Vandussen Gardens, Queen Elizabeth Park, Oakridge Mall, Sinclair Centre, Denman Mall, Croatian Centre, Carousel Cruise Ships, C Restaurant, River Rock Casino Richmond, and others. Westwood Plateau, Vancouver Golf Club, Shaugnessy Golf Club, Capilano Golf And Country Club, Newlands, Swan-e-set Golf And Country Club, UBC Golf Club, Furry Creek Golf Club, Mayfair Lakes, Northlands Golf and Country, and others. Private lessons in students residence or at my personal residence also available. Please call for rates. Study of Harp, Voice, and Composition. 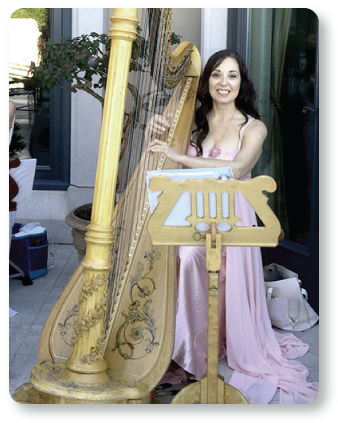 Private Studies in Harp since 1977. Vancouver Community College Music Program. Voice and Operatic Training 1988-1998.